As I reach bus pass age there are various reasons for keeping active. I transitioned nine years ago and work in a very public environment and am well known across the Scottish Borders. Actual accessibility to different sports in this area is probably as much of a barrier to anyone and not just LGBT people. Personally I actively mountain bike and motorcycle, which are both solo sports, and also I am actively involved with Jedburgh Badminton Club. I must confess I hadn’t pursued joining a mixed club – perhaps it was not being local and also for how I may be accepted. But then I thought ‘what the heck’. I’ve been more than welcomed in the club, as far as I’m concerned they accept me for me being Gina, and it’s my personality that sees me through. I’ve been in my work for 24 years, so obviously some staff knew me before and after transition and unfortunately this I feel has been an issue for some. 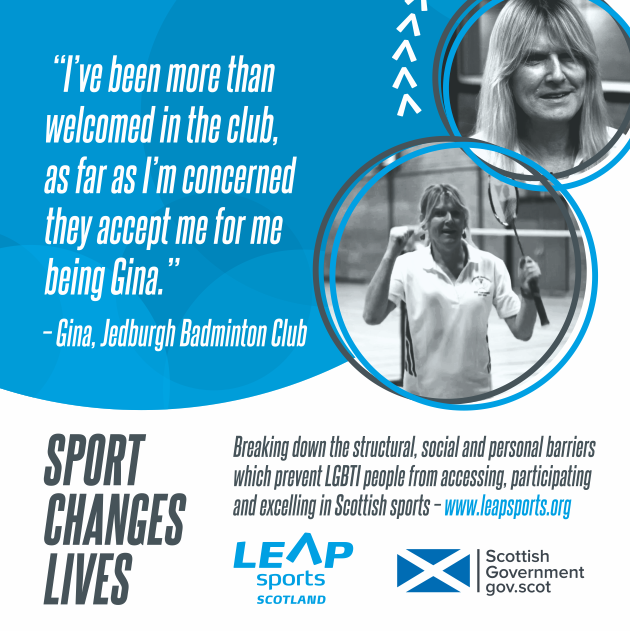 With a new venture such as the badminton club, where I was an unknown, it is easier to stamp your mark as they’ve only ever known me as being Gina. The motorcycle scene is a difficult one, as the leather and exhaust fumed ambience is quite testosterone-filled. I’ve always found that trying to be as confident appearing as you can, holding your chin up and smiling goes a long way to being accepted for who you are. Participation in any sport or hobby is so important, both for mental and physical reasons. It’s even more so for those classed as having ‘mental health issues’. The world needs educated into the fact – just because someone is different to you, for whatever reason, doesn’t make them be open to scorn or vilification. Established in 1974 and based in the Scottish Borders, Jedburgh Badminton Club (JBC) caters for all ages and abilities, beginners through to Border League level, young and old from the age of 6 to 60. JBC is an inclusive club – check out the website for more details . Written on 4th January 2017.